A pop-up café has opened for business in central London – selling just four items, which all contain Cadbury’s Creme Eggs. 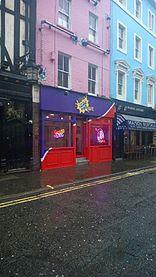 The Cadbury Creme Egg café will be open in Soho on Fridays, Saturdays and Sundays in the run-up to Easter. On the menu are Creme Egg and soldiers, a Creme Egg toastie, strawberries and Creme Egg, and a Creme Egg tray bake. Pop-up businesses are a great way to find out whether there is a large enough market available for your idea to be successful. However, it’s important you don’t overlook insurance. Even for a short-term trading period, you will require a general business insurance policy and also a specialist café insurance to cover your business. The Cadbury’s café has popped up to serve the chocolate-based dishes with a choice of tea or coffee and – according to reports – to win back fans after complaints the firm had changed the recipe for the iconic Easter treat. A year ago, the company’s new American owners came under fire from customers for allegedly swapping the Dairy Milk shell for a generic chocolate one. But Claire Low from Mondelez, which markets the Creme Egg, told The Daily Telegraph the café wasn’t a public relations ruse to remove the focus from complaints about the recipe. Cadbury is the latest in a line of big brands to try the pop-up café idea to attract good publicity. It’s also been used in recent years by companies Marmite, Ikea and Grey Goose.